English learners face a common problem: their writing often lacks clarity and cohesion. That is according to Babi Kruchin and Alan Kennedy who teach at the American Language Program at Columbia University. They recommend that English learners use concept maps – images that show how ideas are connected. Let’s consider a comparison. In some ways, the writing process is like cooking. Gathering the ingredients for a meal requires effort. But, understanding how to put all the ingredients together is far more difficult. Similarly, learning nouns, adjectives, and verbs can be hard to do. But, putting them together into a meaningful story, email, or essay is what is difficult. Doing these things becomes even more difficult when you are writing in a second language. So, writing clear, cohesive paragraphs or essays, can be hard for English learners. To overcome this problem, Kruchin and Kennedy recommend that students make concept maps before writing. Kennedy says concept maps show a writer when his or her writing lacks clarity. Kruchin adds that concept maps help visual learners – people who learn better by seeing ideas. Concept maps are tools for organizing ideas. They usually have three parts: concepts, arrows, and linking phrases. The concepts, which are the main ideas, are in circles or boxes. They are often nouns or noun phrases. Arrows show how concepts are connected. Linking words or phrases go above the arrows and explain how the concepts relate to one another. Linking phrases are especially important. They are the groups of words that show relationships between concepts. "If you say dog and food, those two concepts by themselves don't mean anything. They don't make a statement about the world. 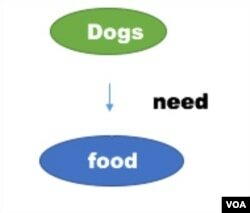 But if you say "dogs need food", then you begin to express an idea that's significant." Novak adds that the linking words or phrases should be short. "You do not want a story between two concepts," he says, "just the expression that is needed to say, 'this concept is significantly related to another concept.'" Generally, the generic ideas are at the top of the concept map and the specific ideas are at the bottom. 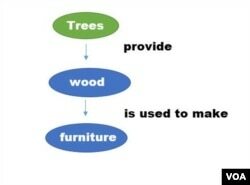 "So, for example, if you wanted to explain that trees provide wood, and wood is used to make furniture, you could have a circle around the word trees… and then you could have an arrow between the word wood and the word furniture, which would also be in a circle, and on top of that arrow it would say "is used to make""
From this starting point, writers can expand concept maps to include many concepts, arrows, and linking phrases. Regardless of how simple or complex the map is, the most important point is that every concept has at least one arrow attached to it, and that every arrow has a linking word or linking phrase. Building a concept map before writing an essay or email will make you think about how your ideas relate to one another. 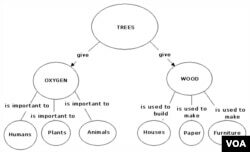 You will realize when you are not explaining the relationships between ideas if you make a concept map that does not have arrows or linking phrases. So, what can you do to start practicing concept maps? You can start by reading and learning common linking words. Kruchin recommends that English learners begin to use concept maps by studying the writing of others. Learning how good writers have connected and developed ideas is an important starting point for learners who want to improve their own writing. Kruchin adds that English learners should begin with a small amount of writing, such as a paragraph. "The author's main idea is this, because of A, B, and C and here is one example to support A, one example to support B, one example to support C."
Doing this exercise, Kruchin adds, will give English learners information about how they can show relationships between ideas in their own writing. Kennedy recommends that English learners master words and phrases that show relationships between ideas. These linking phrases often show cause and effect or tell about the order of events. English learners, Kennedy explains, should practice using a few of these phrases before moving to phrases that are more complex. In particular, he recommends that English learners first use phrases such as "leads to", "causes", "is a type of" and "requires", before moving on to other phrases. Whether your goal is to write novels, poetry, or a message to a co-worker or friend, being able to show a relationship between ideas is an important skill. Concept mapping might seem complicated, but Kennedy and Kruchin wrote an article that can help clarify their ideas. You can find the article on this page in PDF format. Download the article, read it, then try practicing with concept maps. Let us know how concept maps work for you!